In February 2016, the Brazil-FAIMER Regional Institute welcomed its 10th class of Fellows and celebrated this important milestone in Beberibe, Ceará, Brazil. More than 150 people took part in the anniversary celebration, including the 39 incoming Brazil-FAIMER Fellows, alumni who serve as faculty for the program, other alumni, international faculty, and prominent guests. A focal point of the celebration was a session featuring the 10 winners of the Brazil-FAIMER Projects That Work competition. A National Medical Education Day was also held, highlighting the history of the Brazil-FAIMER program and including a presentation by Dr. Francisco Campos, who was the National Secretary of Labor and Education Management in Health of the Brazilian Ministry of Health when the program was established—with support of the Brazilian government that was due in large part to Dr. Campos’ vision and advocacy. Brazil-FAIMER, the third of FAIMER’s Regional Institutes to be developed, began in 2007 under the direction of Dr. Eliana Amaral and Dr. Henry Campos. Dr. Amaral is a Professor in the Department of Obstetrics & Gynecology at Universidade Estadual de Campinas in São Paulo, Brazil, and a 2003 Fellow of the FAIMER Institute. Dr. Campos is Rector and Professor of Internal Medicine at Universidade Federal do Ceará in Fortaleza, Brazil, and a 2002 Fellow of the FAIMER Institute. In recognition of the 10-year anniversary, the Associação Brasileira de Educação Médica (ABEM) published a special issue of its Cadernos da ABEM in March 2016, devoted entirely to the Brazil-FAIMER program. The issue includes an overview and history of the program, as well as summaries of a sampling of the many impressive education innovation projects that have been implemented by Brazil-FAIMER Fellows over the years, including the winners of the Projects That Work competition. A copy of the special Cadernos issue (PDF – 3 MB; in Portuguese) can be accessed here. An English translation of the editorial that serves as an introduction to the issue, written by Dr. Amaral, Dr. Campos, and several members of the Brazil-FAIMER faculty, can be accessed here. The 2014 annual international conference of The Network: Towards Unity for Health (TUFH) took place November 19-23, 2014, in Fortaleza, Brazil. The conference theme was “Strengthening Health Professions Education as a Policy to Improve Health,” and its program included keynote addresses, didactic sessions, workshops, and poster sessions built around this theme, as well as site visits to local community health care facilities. A highlight of the 2014 Network: TUFH conference was the session presenting winners of the second annual Projects That Work competition, sponsored and organized by FAIMER, which showcased seven projects that have been successfully addressing missions related to the conference theme for three years or longer. An annual feature of The Network: TUFH conference, Projects That Work recognizes excellent projects that have succeeded beyond initial implementation and have had a significant impact on health, the community, or the school, in order to encourage the development, implementation, and dissemination of more such projects. An open worldwide call resulted in 64 submissions, from which seven were selected by an international panel of 13 reviewers. The 2014 Projects That Work winning projects were represented at the conference by (pictured above, left to right) Hoffie Conradie (South Africa), Patricia Kelly (South Africa), Gavin MacGregor (South Africa), Suhasini Jayantilal Nagda (India), Damas Dukundane (Rwanda), Michèle Twomey (South Africa), and Jenny Paola Salamanca Preciado (Colombia). The panel discussion was moderated by FAIMER Vice President for Education Bill Burdick. 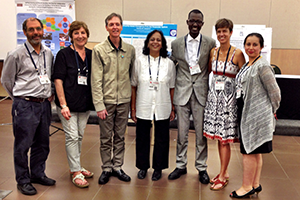 Projects That Work will also be a feature of the next Network: TUFH conference to be held in Pretoria, South Africa, September 12-16, 2015. Check back in January for an announcement of the opening of the 2015 competition application. Registration has been extended through August 31, 2014. For more information, visit: http://www.the-networktufh.org/.